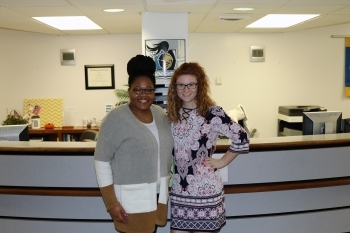 Danville, Va., March 14, 2019 — Danville Community College (DCC) launched an innovative registration initiative this week with the hiring of two full-time enrollment navigators for its one-door model of new student enrollment. Danville Community College recently hired new enrollment navigators to create a one-stop onboarding point to guide prospective students through the college enrollment process. Enrollment Navigator Jazzmine Williams, left, and Assistant Enrollment Navigator Casey Moore, right, began work in these new roles on Monday, March 11. Under this model, Enrollment Navigator Jazzmine Williams and Assistant Enrollment Navigator Casey Moore will be the first faces many prospective students see when they arrive on campus. Together, Williams and Moore will, as their titles imply, assist new students with navigating the application and enrollment process in a single location: The college’s Wyatt Building Admissions Office front desk. Williams and Moore are both DCC alumnae and have worked at the college before. “I began my journey at DCC as a dental hygiene student and later returned to work part-time in the admissions office after earning my B.S. in human services from Old Dominion University in 2013. I worked as the VPT coordinator and interim transfer counselor from 2013 to 2015. I left DCC in 2015 and served as the assistant director of transfer admissions at Radford University until 2018 and returned to DCC as a student success coach,” Williams explained. “I started off as a dual enrollment student in high school. After high school, I became a DCC Knight and did work study in the counseling office. A year or so later, I worked part-time in the admissions office,” Moore said. DCC Coordinator of Enrollment Management Cathy Pulliam highlighted the impact the two new positions will have at the college. Both Williams and Moore added that their experiences as students and employees at DCC have been unforgettable. Summer and Fall 2019 enrollment starts on April 1. Call 434-797-8467 or email admissions@dcc.vccs.edu to learn about the academic and training opportunities DCC has for you.